Slow growing and developing an attractive conical shape, Picea pungens makes an excellent potted Christmas tree. It is also a good landscaping tree with dwarf varieties being particularly useful. 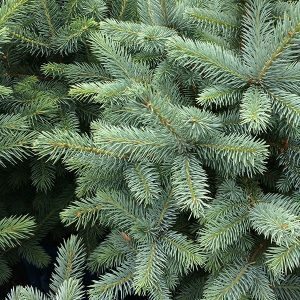 Also known as the Colorado blue spruce, the appeal is in the beautiful blue green starry foliage as well as the natural growth habit. All varieties are slow to very slow growing at first. After 10 years or so growth rate tends to speed up, especially when grown in the garden. Growth rate can be improved in good soil with some additional fertiliser. A little moisture during dry periods will aslo assist. They tend to reach around 2 metres in height over the first 10 years, and when grown in a container this growth rate can be even slower. Perhaps one of the best living Christmas trees of all, Picea pungens will last for years with little care. P. pungens Glauca – A good pyramidical habit. P. pungens Fat Albert – Still pyramidical however a broader growth habit. P. pungens Hoopsii (Hoops Blue Spruce) – Wonderful metallic blue foliage. The tree forms a natural layered structure, very decorative. P. pungens ‘Kosterii’ – Very slow growing at first. If you are growing Picea pungens in a container, every 3 – 4 years you will need to repot into a slightly larger pot with some added high quality potting mix. A little slow release fertiliser in early spring will have the plant looking great by Christmas. After this wonderful little tree has completed its duties indoors, it should be moved outdoors into a position in dappled shade over summer. In late summer to autumn it can be moved into full sun until the next season. In the garden, choose a humus rich well drained soil in a sunny to part shaded position. Position – Full sun with protection from hot drying winds. Soil – Humus rich well drained. Height – Will reach 20 – 25 metres in ideal conditions. In cultivation around 10 – 15 metres. Growth rate – Medium to slow. Foliage – Dense blue/green, sharply pointed needles. Drought tolerant – Medium once established. Conifers, Magnolias, Maples, Dogwoods and Buxus.